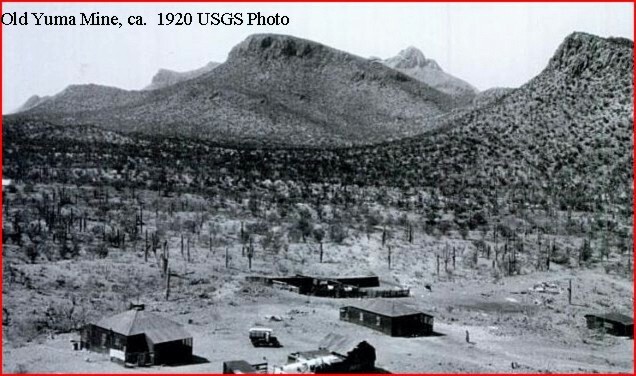 Back in the late 19th Century and early 20th Century, much prospecting was done in the volcanic mountains west of Tucson. Approximately 120 mines and prospects were explored for copper, gold, and silver. According to the National Park Service, the first claim was registered in 1865. The Tucson Mountains are composed of a volcanic edifice that collapsed into a caldera about 70 million years ago. The caldera was about 12 miles by 15 miles wide. The volcano collapsed as the result of eruption of volcanic ash which piled up in flows that reached an accumulated thickness of about three miles. Toward the end of the volcanic episode, magma rose and penetrated the flows, metamorphosing some, and bring with it, hydrothermal solutions carrying copper, gold, silver, and other metals. A more detailed overview of the process is presented in Sonorensis, a publication of the Arizona-Sonora Desert Museum here. See also a history of the district prepared by the National Park Service here. Most of those 120 odd prospects were just holes in the ground, but four mines had some consequence: Old Yuma, Gila Monster, Mile Wide, and Gould mines. (See map at the bottom of this post for locations.) Of the four, the Old Yuma mine was the most famous, not for its ore, but for its museum quality mineral specimens. The Old Yuma mine in the northern Tucson Mountains was primarily a gold mine, most recently owned by Richard Bideaux. The mineralization consists of partly oxidized base- metal sulfides with spotty wulfenite and vanadinite, and gangue quartz and calcite. The minerals occurred as a steeply dipping, lensing and faulted orebody along a fracture zone cutting Cretaceous volcanics and associated with a Laramide porphyry intrusive, the Amole Granite. Shaft and underground workings produced ore from 1916-1947, totaling 5,700 tons ore grading 4% lead, 1% copper, 0.6% zinc, 0.3% molybdenum, 1 ounce silver per ton, and 0.1 ounces gold per ton. The mine is now in a national park and unavailable for collecting. In the latter part of the 20th Century, this mine was prized for its mineral specimens. The two photos are of specimens in the Arizona-Sonora Desert Museum collection (Photo credits to ASDM digital library). 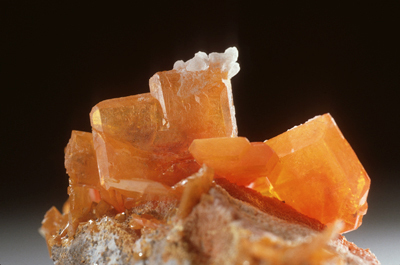 The first photo is wulfenite (PbMoO4), an mineral sometimes used as a source of molybdenum. 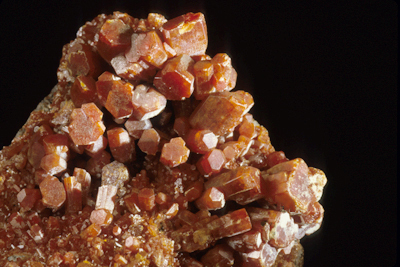 The second photo is vanadinite (Pb5(VO4)3Cl) one of the main sources of vanadium. The Gila Monster mine was located about one and a half miles south of the Old Yuma. It was developed on a vein of lead, zinc, copper mineralization adjacent to a large block of limestone that was engulf in the caldera volcanics. Production was minor, but interesting specimens of red-fluorescing calcite and willemite, a zinc silicate (Zn2SiO4) were taken from the mine. Reiniger established the Mile Wide Copper Company. It was so named because the width of the claims was a mile wide. He concentrated on the Copper King which became known as the Mile Wide Mine. In the process of development Reiniger abandoned the old shaft in favor of a new site up the hill. 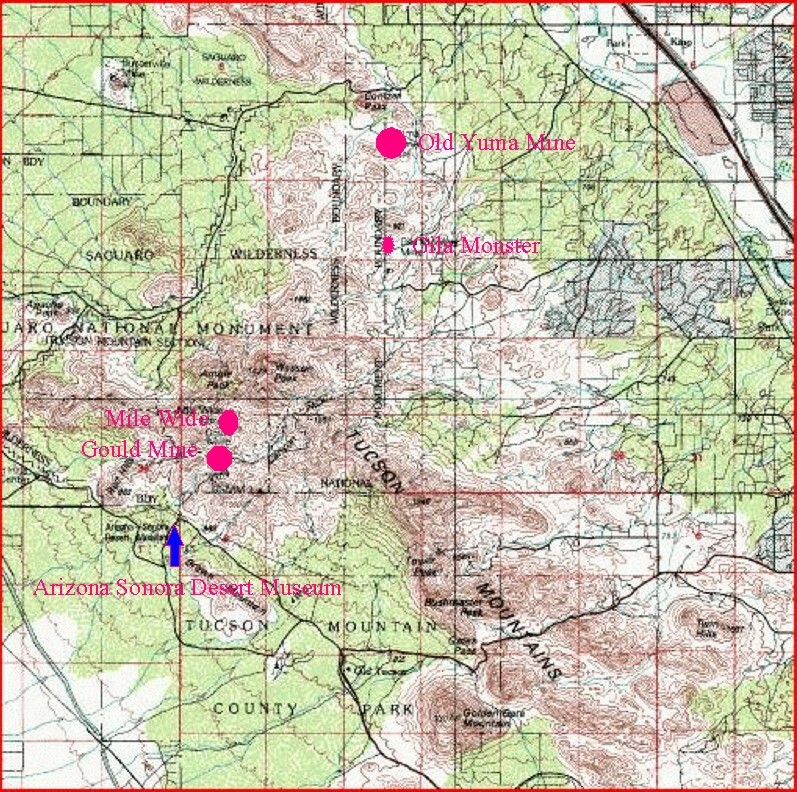 While mining at that location he reported a copper strike which purportedly would be the equal if not superior to the largest Arizona copper mines. As a result, stock sales increased and Reiniger further developed the property. He built four houses, a work shop, mess house, rock crusher, and mill. In addition he improved the road to make it possible for his six trucks to haul more ore to Tucson for rail shipment to the smelter at Sasco which was just north of Silver Bell. Reiniger used the mining activity and the promotional hype to practice fraud on the stockholders. In late 1919 he disappeared taking half the money derived from stock sales. In addition he sold up to $100,000 of his own stock before his departure. The Gould mine was located half a mile south of the Mile Wide mine. It was established in 1906 and produced 45,000 pounds of copper before it ceased operations in 1911. It seems that the mines of the Tucson mountains were teasers, lots of smoke, little fire. Saginaw Camp, at the lower end of the Tucson Mountains, was a gold and silver mining camp in the early 1890s. Enlightening article. I’ve covered this material in my publications on the Tucson Mountains. Note to readers, Ascarza’s books are very interesting and contain many historic photographs.